It is such a pleasure to be included in another Art Gallery Fabrics Blog tour. Today is my turn to showcase Bonnie Christine’s designs for the Forest Floor Blog Tour, uniquely inspired by her outdoor adventures. The Forest Floor Collection is sophisticated, yet whimsical and the prints offer diversity for sewing and quilting projects. Wide-eyed bunnies, forest mushrooms and enchanting botanicals foster the magical theme for these fabrics. These storybook elements inspired me to create two very special projects for young children or at least those young at heart. The first project is a quilted pocket pillow using the book Growing Up Modern and the fabrics from the Dawn and Twilight colorway. My second creation is a floor quilt with a vintage-feel suited for playtime, reading time or even an outdoor picnic. For the quilt I used fabrics from the Dusk and Sunset colorway. You can shop these prints and the AGF denim here. The two surprise guests brought this tour to life. Small and sweet, Margie, follows her mom and grandma as they shop in our local quilt and fabric shop, Needle in a Fabric Stash. I am delighted to watch her grow as she learns to walk and talk amidst the bright and happy fabrics in the store. As you can see she is a natural in front of the camera too! 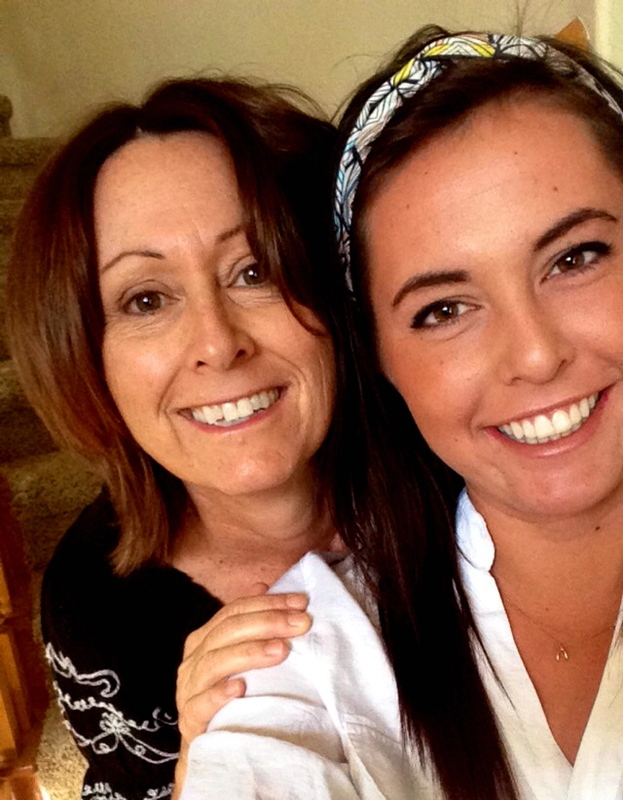 My friend Alexis Wright, author of My Sweet Sunshine Blog, and I enjoy collaborating on these blog tours. Earlier this year, we shared a photo shoot for the first time during the Coastline Blog Tour. Alexis takes beautiful photos and was thrilled to have sweet Margie as her model for the day. The quilted pocket pillow is an extremely popular item in our shop. Moms and grandmas make these up by the dozens for Christmas and other occasions for the young readers in their life. By using a generous fussy cut of the pink bunny featured in the In the Thicket Dawn print, I customized the patchwork pocket. What a great focus print this makes! It has been a while since I’ve made a quilt with curved edges! I was ready for the challenge and I designed the quilt with several elements in mind. First I was influenced by the marriage of the dusk colorway and the Art Gallery Black Denim patchwork. I also make a point to utilize fabrics in such a way as to have minimal waste. So, I used the width of the AGF Denim as my guide and implemented a modified technique of “quilt as you go” by layering the front and applying the 1.5 inch curved bias that separates the denim borders from the sweet green bunny fabric, In the Thicket Dusk. 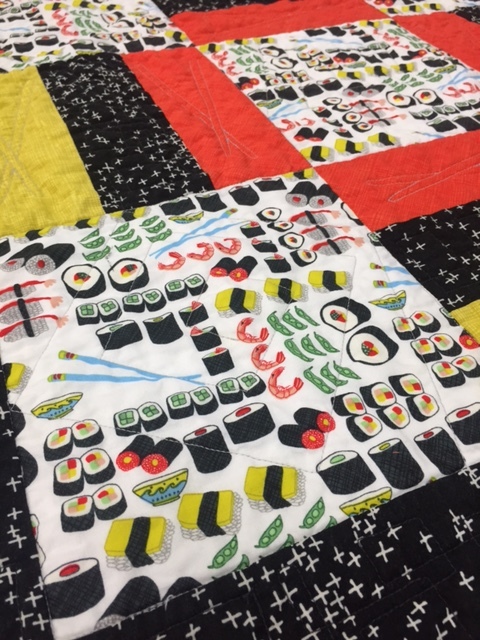 The vintage vibe of this quilt is just charming, right down to the little pin tucks that ended up being necessary to get the bias to lay flat around the four curves. I can’t wait to draft and sell this pattern for future Art Gallery prints that look great combined with their denim selection as well as the Forest Floor collection does. Cute-as-can-be, Margie’s darling dress, was not one of my projects, but her grandma made it out of the Nature Study Bark print specifically for the photo shoot. This print is one of my favorites. Just think what a great combo all of these projects would make for professional family pictures or even Easter pictures. It reminds me of the cherished Easter photos in our lush background we took as a family when my kids were growing up. I hope you’ve enjoyed the projects and find that they spark your creativity when deciding what to make with the mystic and magical Forest Floor collection. To shop the entire Forest Floor Collection, AGF Denims and patterns visit our online shop or stop by our brick and mortar shop in Temecula, CA. Our favorite part is when you share your completed projects with us on social media. Find us on Instagram and Facebook. We can’t wait to see what you make! Be sure to check out all of the makers on the Forest Floor Blog Tour including Maja Wlusek on Friday, July 22 and Cheri Lehnow on Tuesday, July 26. You can also visit Bonnie Christine’s blog for more details and other great ideas of what to create with the Forest Floor fabrics. 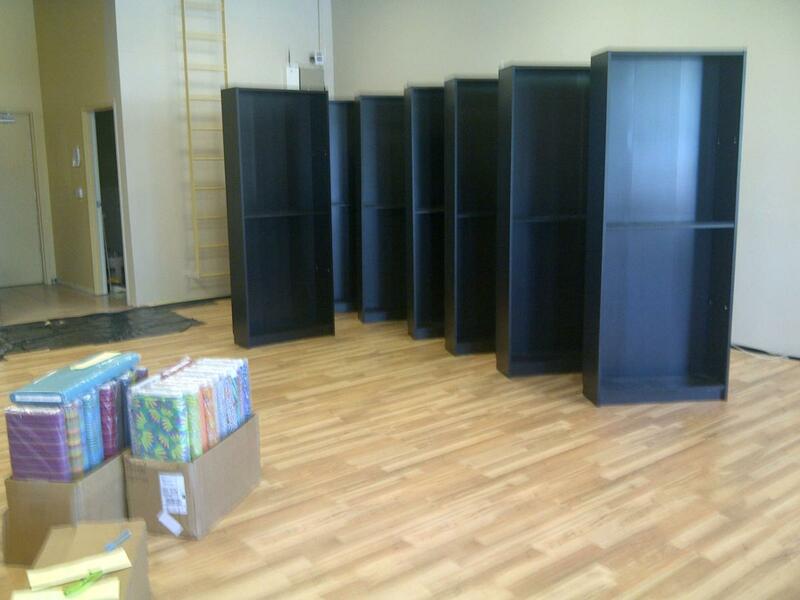 The floors are in, boxes are arriving and the fabric is making its way on the shelves! Here is a sneak peak for what is in store for our grand opening. The bright and modern atmosphere is really coming along and is shaping up to be even better than the original vision. This is not even half of more exciting construction to be done. 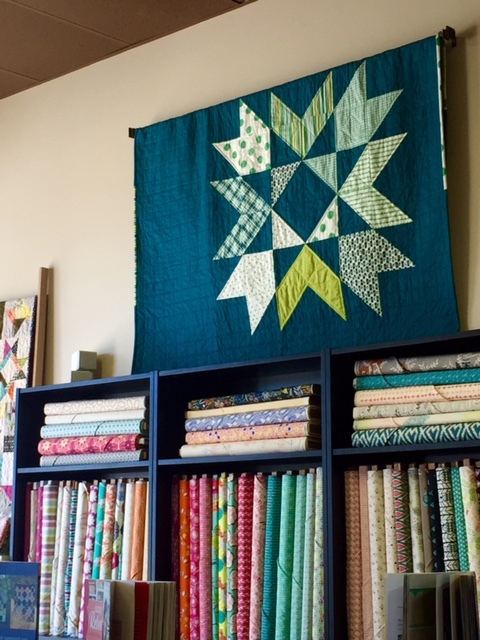 Join us on November 8th to see the final product and start building your own fabric stash!